If there’s a topic that’s bound to unite all Singaporeans, it’s food. Ask any local epicurean about his favourite eateries, and you can count on hearing a lengthy list of recommendations spanning everything from hawker stalls to fine dining establishments — all of which serve a diversity of cuisines. He or she may even have predictions of which eateries are primed to get a coveted Michelin star (or two, or three). 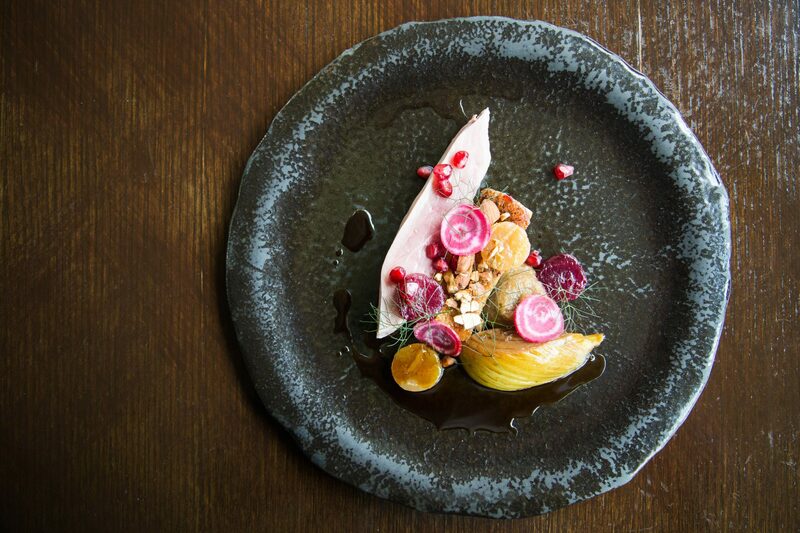 This comes as no surprise, though, seeing how the dining scene here has truly flourished over the years thanks to new restaurants consistently sprouting up, and existing ones rolling out fascinating new dishes. Another contributing factor to Singapore’s ever-growing reputation as a culinary destination, is its abundance of restaurants offering curated dining experiences that feature the finest ingredients, impeccable culinary techniques, and top-notch service. Underscoring this is the OCBC Gastronomic Adventures programme that features some of the city’s top eateries with special menus available only for OCBC’s Credit and Debit Cardmembers. Each of these showcases a special dish that’s created by the chef and exclusive to the OCBC menu. Whether you’re yearning for elegant modern European food, or an omakase meal that highlights the best seasonal produce in Japan, there’s sure to be something that’ll suit your fancy. This dining programme also offers perks for OCBC VOYAGE and 365 Cardholders. VOYAGE Cardmembers get to enjoy drink-pairing options at special rates, while those with the 365 Card get to receive 3% and 6% cashback on dining for weekdays and weekends respectively. If you’d like to become an OCBC 365 Cardmember, simply apply here by 31 July 2018 and spend S$300 in the first month of your card approval to receive a S$50 cashback. Terms and conditions apply. In this second instalment of our OCBC Gastronomic Adventures series, we’ve put together this guide on where to go for an ultra-memorable, exquisitely curated dining experience. All that’s left to do now is make your reservation at your desired restaurant, and quote “OCBC set menu”. Opened in January by chef Sun Kim of one-Michelin-starred restaurant Meta, Kimme is a relative newcomer to the Amoy street dining enclave. But it has already been shaking up the local gastronomy scene with its rendition of modern Asian cuisine inflected with Korean and Japanese flavours. For OCBC Gastronomic Adventures, it has introduced a special four-course set menu for lunch and dinner, priced at S$88++. The meal starts off with an appetiser of Saeujang, which is exclusive to OCBC Cardmembers. It features raw amaebi (sweet shrimps) and its roe, cured for three days in a combination of soy, sake and mirin that accentuates its natural sweetness. 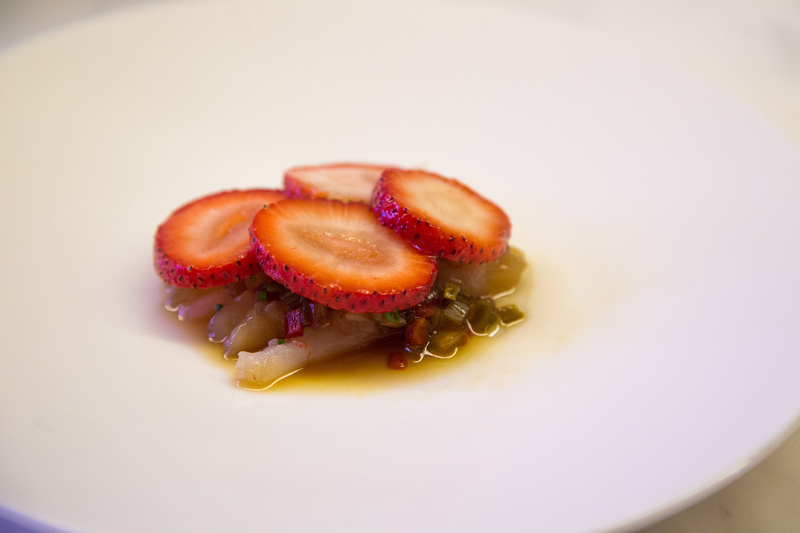 The shrimp is paired with a piquant chilli salsa, and garnished with strawberry slices. Other highlights on the OCBC menu include barbecued quail, inspired by Korean barbecue and accompanied with a moreish mushroom ragout. Chunks of pickled turnip are scattered on top for bursts of sourness, while a smear of celeriac imparts sweetness to the juicy and slightly charred quail meat. Another standout is the main course of pork ribs, braised for four hours till they’re fall-off-the-bone tender, and garnished with crunchy wild rice. The OCBC menu is available till 20 August 2018. For a more indulgent meal, OCBC VOYAGE Cardmembers can add on Kimme’s Flight of the Orient drink-pairing option, which features Momokawa Junmai sake from Aomori Prefecture, Red Monkey makgeoli, Hansan So Gok Ju (a traditional Korean liqueur) and Damsoul tea (a mix of premium pine liqueur with jasmine-infused lemongrass and strawberry tea). This is priced at S$60++ (U.P. S$90++). Few restaurants boast a setting as beautiful as Pollen’s. Nestled inside the Flower Dome at Gardens by the Bay, the establishment is surrounded by lush greenery and brightly hued flowers. It also carries a breezy, laid-back atmosphere, thanks to the abundant sunlight that pours in through its glass windows. Gorgeous ambience aside, Pollen is known for its refined modern European cuisine incorporated with Mediterranean flavours. As part of OCBC’s Gastronomic Adventures, it has launched a three-course lunch menu (S$65++) and five-course dinner menu (S$125++). Treat yourself to the latter option, which features highlights such as a fluffy potato and leek sabayon (filled with treasures such as salty slivers of cured ham, crisp croutons, and Jamon Joselito), and desserts like porcini mushroom mousse contrasted with chocolate and a tart sea buckthorn sorbet. Diners can also look forward to the OCBC-exclusive dish of pan-seared Hokkaido scallops crusted with curry powder and paired with Jerusalem artichoke prepared in three ways — as a confit, purée, and crisps. These sit on a bed of smoked cream and are drizzled with aromatic tarragon oil. A dash of sherry vinegar caramel is added into the mix for a tinge of sweetness. For mains, choose between grilled Rangers Valley beef short rib or Pekin duck. The well-marbled beef is deliciously succulent thanks to its elaborate preparation process that entails being smoked for 24 hours in a Josper Oven. It’s presented atop fresh green apple purée, which help cut the fat. As for the duck, it’s composed of a poached breast and roasted leg braised in pomegranate and complemented with an addictive smoked hummus. The OCBC menu is available until 20 August 2018. For lunch, VOYAGE Cardmembers can add on a drink-pairing option for S$30++ (U.P. S$50++), inclusive of two glasses of wine, petit fours, and coffee or tea. The dinner drink-pairing option is priced at S$45++ (U.P. S$65++) and includes one cocktail, two glasses of wine, petit fours, and coffee or tea. Ask any chef about the inspiration behind his food, and you’re bound to get any one of these answers: A childhood memory, a parent or relative gifted in cooking, or even a culinary veteran the chef once worked with. For resident chef Kazuhiro Hamamoto of omakase restaurant Ki-sho 葵匠, however, it was his former principal Masahiro Nakata of Kyoto culinary school Taiwa Gakuen Education Inc, who inspired the two dishes he created for Ki-sho 葵匠’s OCBC menu. According to chef Hamamoto, Nakata was instrumental in teaching him how to use seasonal ingredients in his food. These specially crafted dishes are hairy crab with kamo-nasu (an eggplant grown in Kyoto), and hamo konabe (pike conger hotpot) — available for lunch and dinner respectively, and available only on the OCBC menus. 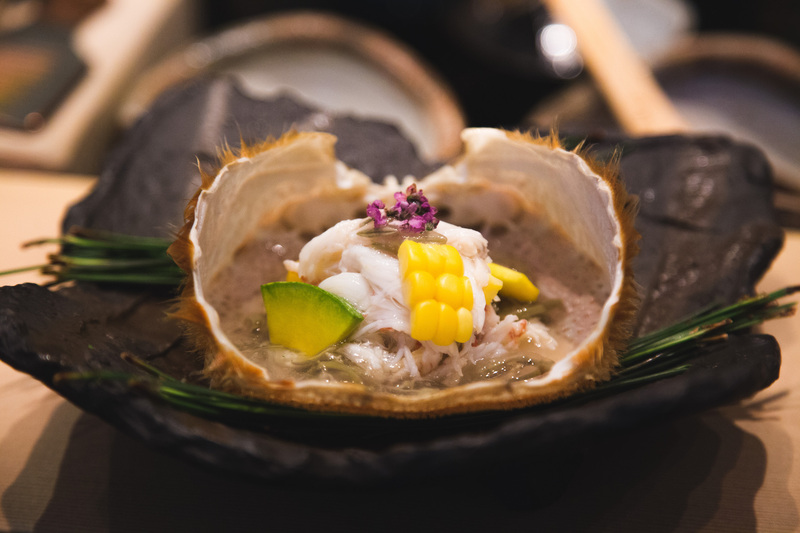 The former dish is particularly intriguing, as the kamo-nasu is covered with Hokkaido hairy crab meat, and presented inside the crab’s shell. The eggplant is also paired with chewy, gelatinous junsai (a type of water plant) for textural contrast, and topped with clusters of Okinawa sweet corn. The other courses on the lunch menu (S$150++) are equally outstanding. A sashimi platter arrives decked out with the likes of uni wrapped in sea bream, as well as otoro and — our favourite — fatty and juicy kinki fish that’s aged for 10 days before being seared for a slightly smokey taste. Then there’s the Ohmi wagyu that’s grilled over binchotan, rolled around rice, and capped with uni and egg yolk for an umami-rich explosion of flavours. Dinner (S$300++) has a slightly different repertoire, with highlights like uni and caviar, nigiri sushi, and wagyu sukiyaki. VOYAGE Cardmembers can complete their lunch or dinner set with a 720 ml bottle of Ki-sho’s premium sake (which has a rice polishing ratio of only 18 percent) at S$408++ (U.P. S$458++), or sake pairing for six courses at S$128++ (U.P. S$158++). The OCBC menu is available for lunch and dinner until 20 September 2018. Emmanuel Stroobant is a culinary jack of all trades, but at heart, he is a dedicated chef who excels at Asian and French fusion flavours. His playground is the one-Michelin-starred Saint Pierre at One Fullerton, an establishment that checks all the boxes when you think of haute cuisine. The six-course Gastronomic Adventure menu (S$168++) presents a stream of Saint Pierre classics for the tasting, where seafood is the focal point. For the appetiser, a creamy round of Hokkaido scallop comes seared in almond butter. The meat adopts a fine crust that almost crumbles, and, when topped with a few drops of earthy curry oil, its sweetness intensifies. 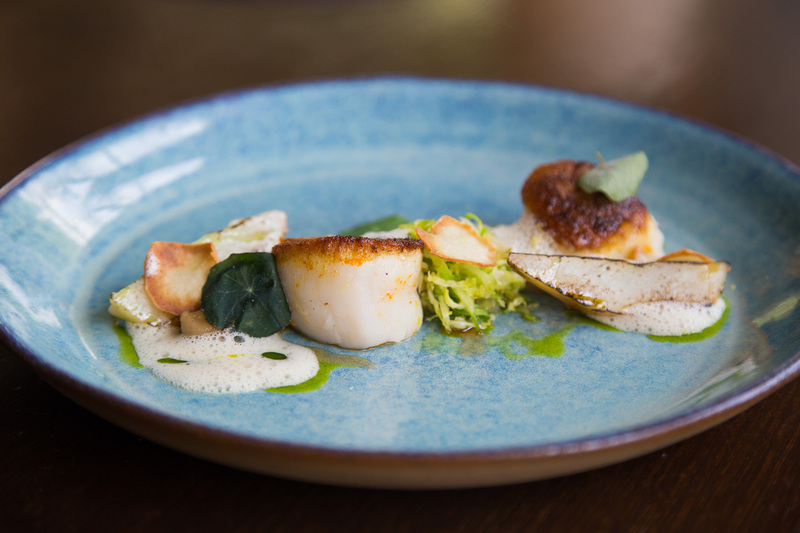 The scallop set a standard that we thought could not be topped, until the cod arrived. Wafts of dashi consommé travel with the fish to your table, and once served, you see a pristine hunk of Atlantic cod there for the taking. Prod your fork into the fish and watch as it springs apart into thin slices. Spoon some in your mouth with the umami broth, and revel as the intricate medley of sugar and salt transports you to heaven. 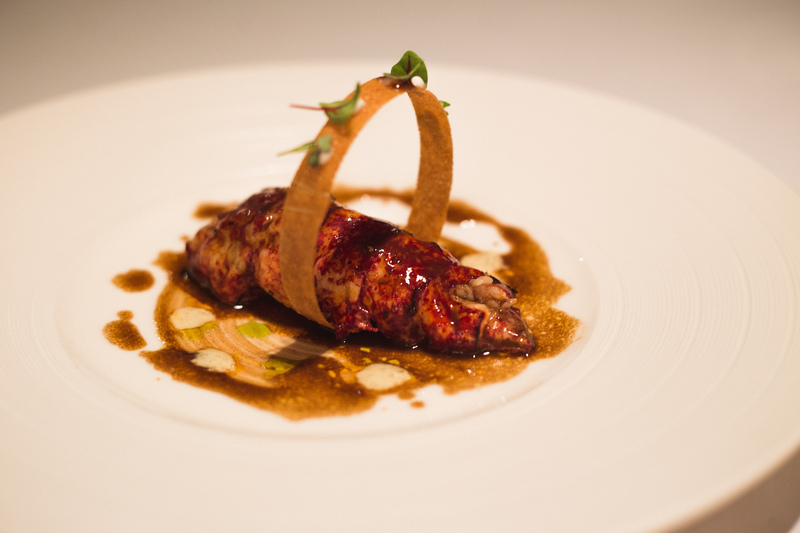 For the OCBC special dish, Stroobant has created a lobster dish that is beautifully simple. Bleu lobster tail is cooked to perfection and dressed in a light ginger and coriander sauce that delivers spice without overpowering the lobster’s inherent richness. Saint Pierre flies the lobster in from France thrice a week, so the morsels that you eat are quite literally fresh off the boat. The OCBC menu is available for lunch and dinner until 20 September 2018. VOYAGE Cardmembers can have their meal with the wine-pairing option at S$98++ (U.P. S$118++) to enjoy French wines that form an impeccable union with every course that arrives.